Arkonoid, Burgertime, Crystal Castles, Centipede, Dig Dug, Donkey Kong, Donkey Kong Jr, Donkey Kong 3, Frogger, Galaga, Galaga 2000, Galaga: Enduring Freedom, Galaxian, Galaxian Part X, Gridlee, Jr. Pac-Man, Liberator, Mappy, Millipede, Missle Command, Moon Patrol, Mr. Do, Mr. Do's Castle, Ms. PacMan, PacMan, PacMan Plus, Pengo, Phoenix, Pooyan, Qix, Rally-X, Space Invaders, Space Invaders Deluxe, Sinistar, Super Breakout, Super PacMan, Super Zaxxon, Tetris, Zaxxon. 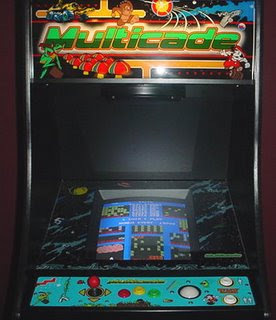 If you have an older Multicade version you bought from us and want to update with all the new 40 games you can send us the CPU board out of your game along with $50 plus $5 shipping and we will update and ship back to you. Do you do retro style computer games? Where's respect for video games? Mastiff Releases Massive Song List for "Pump It Up: Exceed"